With a career spanning almost 20 years and having worked across the country, Maulina Gupta brings with her an intense understanding of the hospitality industry in India. 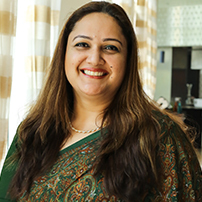 Having been associated with Hyatt Hotels Corporation for more than 8 years, she embraces the values of the organization and dynamically leads the young, vibrant and promising team of Hyatt Place Gurgaon/Udyog Vihar, She has been successful in engaging the staff at all levels thereby, creating an environment wherein everyone is comfortable and at their best leading to elevated employee satisfaction. Maulina Gupta is a dynamic and accomplished executive with outstanding records in a vast array of professional endeavors encompassing start-up, turnaround and new business development in the Service Industry. Hailing from a defense family background, Maulina Gupta is a gypsy at heart, who loves travelling with her son.